This week's Illustration Friday theme is "Plain". I grew up on the plains, so the obvious first choice would be some type of illustration of those endless horizons. But I am tired of life on the prairie, so I looked for something else. 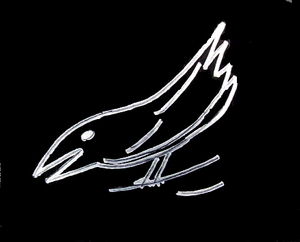 Crows are rather plain, I decided, so I tried drawing a crow using plain black marker on plain white paper. Then I inverted the colors digitally. Not too bad. A while back I read a Lao folktale about a crow and a peacock: Once, long ago, the crow and the peacock were good friends. Everyday they would go out together to work or to play. Now in those days the crow and the peacock both had plain white feathers. One day they were playing in a field of brightly colored flowers. "Look, friend Peacock. Don't you wish we wore bright colors like those flowers?" "I think that would be wonderful, friend Crow. I am tired of these plain white feathers." Then crow had an idea. "Why don't we PAINT ourselves? I can paint your feathers and you can paint mine!" The peacock agreed. So the next day Crow began to paint Peacock's feathers. He used the most beautiful colors. He painted peacock's breast and head a magnificent blue. On peacock's tail feathers he drew elaborate designs. He created large rainbow spots like brilliant eyes on peacock's tail. Crow spent many hours painting his friend. When he was finished Peacock spread his tail feathers and began to strut around. He wanted to go and show everyone his beautiful feathers. "Now it is your turn to paint me," said Crow. But Peacock did not want to waste time drawing designs on Crow. He simply took a pot of black ink and poured it over crow's head. "There you are. That should do." And the proud Peacock strutted off to show his feathers to the world. So today the crow is all plain. And even though Peacock IS beautiful, It is clear that he is too proud for his own good. A good story, I think. I've always liked crows. I like the way your crow turned out. Great lines. Thanks for sharing that folktale!